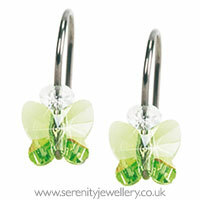 8mm crystal butterflies with a 4mm clear faceted crystal on Blomdahl hypoallergenic natural titanium hooks. 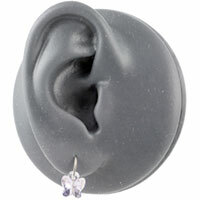 These earrings come with Blomdahl silicone hook stoppers. 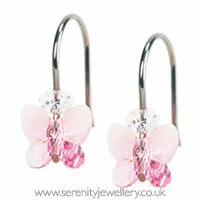 Love these earrings as just the right drop and shine to make them "dressy" but good for daywear. Non-irritating. Only complaint is that the wire is a bit dark - would have been nicer if the wirer was paler or slightly thinner. 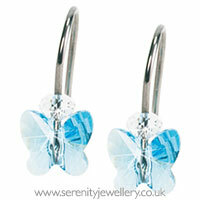 These are lovely earrings, not too big, very sparkly and great for sensitive ears too. Thinking of getting another pair in a different colour. 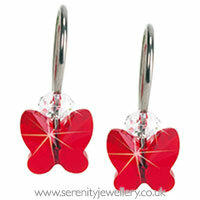 We ordered two pairs of these very pretty earrings in differing colours. 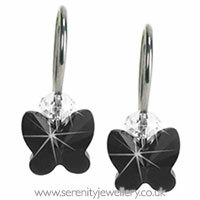 Perfect for special occasions and not too big. Tuesday, 24 July 2012 | Karen. My daughter chose these, a present for her. They are very pretty and good quality. 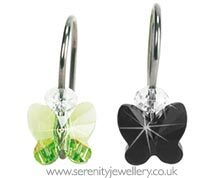 She has them for special occasions and is thrilled with them as she can't wear earrings unless they are gold or titanium. Just the right size for a child and adult alike.